In my last Blog Traffic Report, I shared that I was a “hot freaking mess” in February. (Don’t remember that? Check out last month’s post and learn the 5 Mistakes I Made on my Blog This Month. The beauty of finding yourself at an extreme low is that you have nowhere to go but up. I’m happy to report I did exactly that in March. 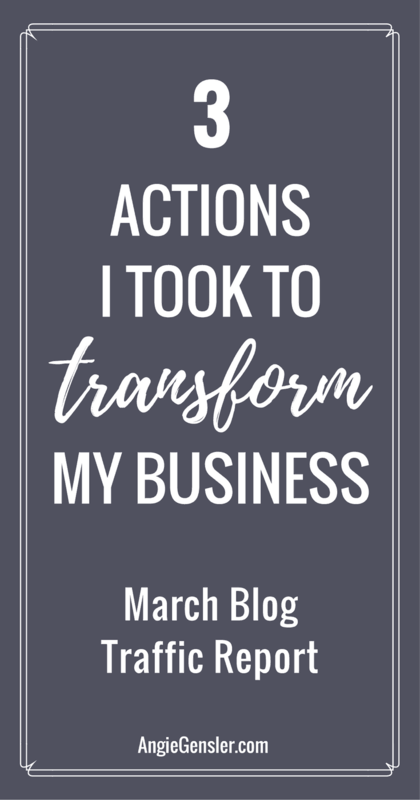 When I look back on March, there were three major actions I took that transformed me from a hot mess in February to confident and productive in March. Narrowed my social media strategy down to the bare bones so it’s actually manageable and fulfilling. I dove deep into the world of mindset and gained so much clarity on my purpose and my goals. I want to unpack the details behind these three transformative actions, but before I do, let me share my traffic results from March. The screenshot below compares March with the previous 31 days. At first glance, the comparison is a little upsetting. The number of sessions and users went down in March. However, those two stats don’t tell the whole story. Take a look at the rest of the data. 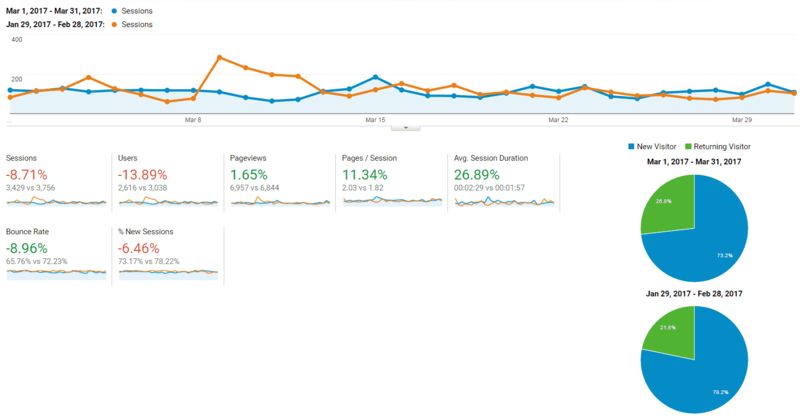 Pageviews, pages/session, and average session duration all went up. Additionally, my bounce rate went down! Those stats had me jumping for joy. Even though I may have reached fewer people this month, the rest of the data is telling me that I reached a more engaged audience. They are spending more time on my website and engaging more with my content. The one stat that concerns me is the conversion rate. The percent of users opting into my email list continues to decrease each month. One could argue this is because the percent of return visitors is increasing each month. So, let’s do the math! The percent of return visitors to my site increased from 21.8% in February to 26.8% in March. When I calculate my conversion rate based only on new visitors it shifts from 15% up to 15.5% in February and 12% to 13% in March. Unfortunately, a 1% or less difference is not statistically significant enough for me to write this one off to returning visitors. There is a bigger issue going on with my conversions. When I launched my Social Media Content Calendar in December it converted like crazy and had people flying onto my email list. However, with a third of the year already over the calendar doesn’t have the same appeal. In an effort to share my knowledge, help others, and increase my conversions, I’m working on a free 5-day Pinterest for Business Boot Camp. The Boot Camp will be an email course with daily training videos and resources to help online business owners increase traffic and leads from Pinterest. I’m also in the midst of creating a #PinterestBootCamp blog post series. This is a 5-part series designed to teach you how to turn Pinterest into a traffic generating machine for your blog. The first two posts have been published and the final three posts will be published in April. To learn more about the #PinterestBootCamp series, check out the first post of the series, Is Pinterest Right for My Business? 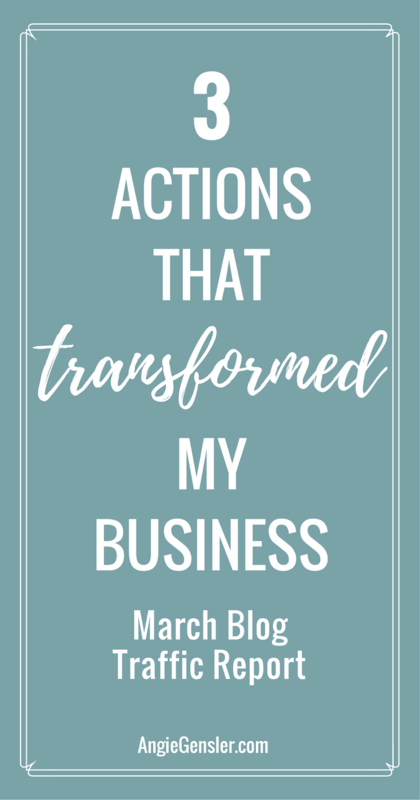 Ok, time to move on to the good stuff – the 3 transformative actions I took this month! Even though SQ was the solution to my problems, I’m extremely frugal and a control freak, so I was hesitant to pull the trigger and make the investment. You know what finally changed my mind? My cleaning ladies! I came home one day in tears at how stressed I felt. I walked into a clean home and instantly felt better. Then it hit me – I pay $90 a month to have my house cleaned to save me a few precious hours each month, but I won’t pay $40 a month for SQ to save me a few hours each WEEK? Something’s wrong here! That night Trevor and I pulled the trigger and started our free trial of SQ. It took a lot of work to get it set up, load all the posts, and create all the schedules, but now it’s set and I haven’t stressed once about my social media posts. The best part of SQ is you can customize your plan. The pricing on their website discloses $19, $39, and $79 plans, but you can actually customize every single feature and detail. When you customize your plan the prices become even more affordable! Reach out to them and ask about custom plans. The plan we customized only costs $30/month and it’s more robust than MeetEdgar, Buffer, and HootSuite combined! Thank you SmarterQueue for saving my sanity and transforming my business! The investment in SmarterQueue forced me to sit down and iron out a very detailed social media plan. When I had it all down on paper, I realized I was doing too much and everything was suffering. This was extremely embarrassing because I advise against this very thing in my blog post, Why You’re Not Mastering Social Media, and What You Can Do About it. Essentially, I was trying to be a jack of all trades, or in my case, a jack of all social platforms – but a master of none! I didn’t have time to create great content or connect with people on any of the social platforms I was trying to maintain. I decided to narrow my social media focus and put my time and energy into my own Facebook Group, Team of One Biz Owners. Thanks to SmarterQueue, the other platforms will still have consistent posts throughout the day with good content, but I won’t monitor those platforms daily or be as active on them as my Facebook group. Since making that change, I’ve felt a huge weight lift from shoulders. What’s better, I’ve started to connect with people again! When I was managing too many social media platforms I didn’t have time to connect with other people and I could feel the effects on my emotions. My business wasn’t fun anymore. I had lost my purpose. At the end of March, in a moment of inspiration, I wrote on a notepad, “have FUN, help others, make a difference.” That’s exactly why I started this business, and I don’t ever want to lose sight of it. If I’m not having fun, helping others, and making a difference, there’s no point! And that leads nicely to the third transformative action I took this month. The third and most impactful action I took this month wasn’t a tool I purchased or strategy I implemented. It was simply a shift in mindset. After a difficult February filled with emotional ups and downs, I was in need of a little personal development to get my head and emotions in a better place. I stumbled upon the Mind Your Business podcast with James Wedmore and Pheobe Mroczek and Episode 47: Inspired Launching with Kimra Luna caught my eye. Kimra’s story blew my mind. Kimra talked about the book, The Power of Your Subconscious Mind by Dr. Joseph Murphy. She shared how it made a significant impact in her life and allowed her to manifest a 7-figure business. In the podcast, Kimra said, “I utilize The Law of Attraction, spirituality and my intuition to guide me every day.” That statement really resonates with me and it’s what I want for myself. No more overthinking, stressing over strategy, or fretting about every decision. I am ready to trust in God and my instincts. What a powerful and freeing feeling! After listening to the podcast, I immediately started to read The Power of Your Subconscious Mind. A few days later, on my way to work, I was listening to Episode 22: The Biggest Lessons We Learned in 2016 of The Femtrepreneur Show. One of the lessons Mariah Coz and Megan Minns discussed was mindset! My ears perked up when they mentioned a book they both love, You Are a Badass, by Jen Sincero. I checked out You Are a Badass from my library and blew through it in a couple days. That book speaks to me! If you want to feel empowered and get some laughs in the process, read You Are a Badass. My journey into mindset continued to go further down the rabbit hole throughout the month of March. I also read The Miracle Morning by Hal Elrod and I’m doing the Miracle Morning 30-day “Life Transformation Challenge” throughout the month of April. I can’t wait to report the results to you next month. 30 days of beginning my day with meditation, affirmations, visualization, exercise, reading, and journaling – I’ll be a Buddhist monk by the time I’m done! Ok, all jokes aside, I’m hopeful the Miracle Morning will help me handle stress and maintain energy levels throughout the day. Additionally, I hope to learn to trust my instincts and listen to God when making decisions – providing me with more confidence and peace in my day-to-day life. There you have it. 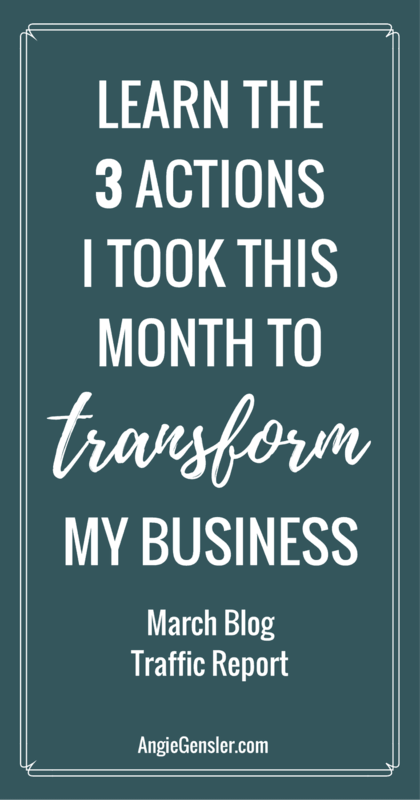 Those are the three actions I took in March that transformed my business and my mindset! Invested in SmarterQueue – a social media management tool. It’s costing me about $30/month and saving me hours of time each week. Narrowed my social media strategy to focus on my Facebook Group, Team of One Biz Owners. This allows me to connect with other people and fuel my purpose – have fun, help others, and make a difference. Dove deep into the world of mindset and read The Power of the Subconscious Mind by Dr. Joseph Murphy and You Are a Badass by Jen Sincero. Also started the Miracle Morning 30-day “Life Transformation Challenge.” Check back next month for my April Traffic Report to see how it went! What mindset or business books have made a transformative difference in your life?